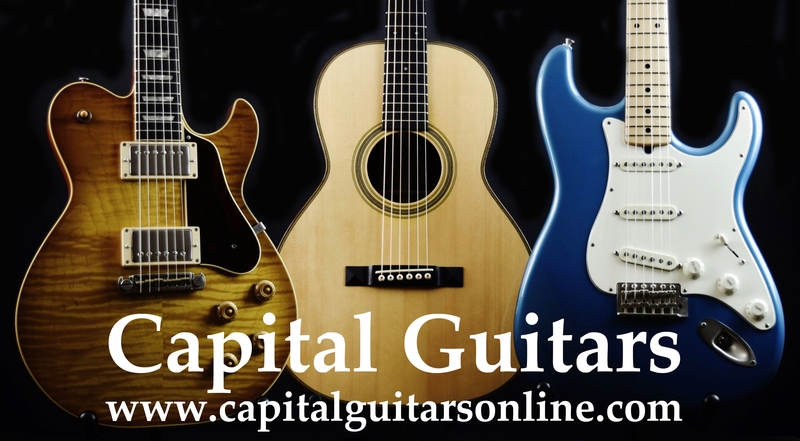 Offered here is guitar for the player who wants a guitar that can do most anything. Check out this incredibly flexible Taylor T5z Custom Koa. The T5z looks much like it's older sibling, the also quite flexible T5, but as compared to the T5, is slightly smaller in size, has a 12" fingerboard radius and is equipped with jumbo-sized frets, making it geared more for musicians used to playing electric guitars. The T5z is a fully hollow instrument with back, sides and neck made of Sapele and with a highly figured Koa top. It has a 24-7/8 scale length and a 1-11/16" bone nut. It has an Ebony fretboard with a sleek low profile neck shape. The tuners on this example have been upgraded to Gotoh 510's with 1:21 ratios. The electronics on the T5z are really what make it special. It is equipped with three pickups; a magnetic pickup hidden underneath the neck, a visible stacked humbucker near the bridge and an acoustic body sensor pickup on the interior of the sound board below the bridge. The controls include a master volume, active bass, active tone and a five way pickup selector. The five way switch postions options are: 1) acoustic mode with the hidden neck magnetic pickup and the internal body sensor; 2) the neck magnetic pickup only; 3) the bridge humbucker only; 4) the neck and bridge magnetic pickups wired in parallel; and 5) the neck and bridge magnetic pickups wire in series. These pickups options and and the active tone controls allow for almost unlimited tone options with this guitar. Please check out the very detailed video review conducted by Wayne Johnson of Taylor which I have included here. Wayne does a superb job of demonstrating all the various guitar sounds that the T5z replicate much better than any brief and inadequate sound sample that I could otherwise provide. It can reproduce an natural acoustic sound and the tone of almost any electric instrument. With it's thin body (2" deep), light weight ( 5 pounds, 4 ounces) and it's sleek neck, this may be the easiest guitar to play that I have ever encountered. Being fully hollow, it makes for a great couch guitar to keep by your side, even without amplification. This 2017 T5z is in near mint condition with no flaws of any significance and the frets are like new as well. It comes in it's original brown Taylor hardshell case, also in near mint condition. A new example can be purchased for $3,199 but this near new example with the upraded tuners can be yours for hundreds less. Make this beautiful and incredibly versatile Taylor acoustic/electric yours!